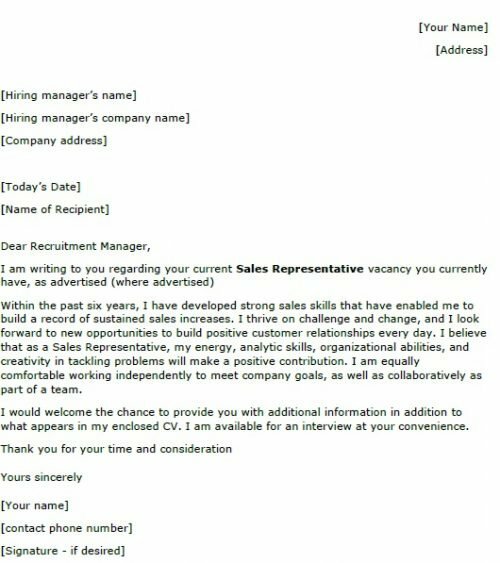 Use this covering letter example if you are going to apply for a Sales Representative job application. You should amend this letter as suitable before sending it to the employers. Within the past six years, I have developed strong sales skills that have enabled me to build a record of sustained sales increases. I thrive on challenge and change, and I look forward to new opportunities to build positive customer relationships every day. I believe that as a Sales Representative, my energy, analytic skills, organizational abilities, and creativity in tackling problems will make a positive contribution. I am equally comfortable working independently to meet company goals, as well as collaboratively as part of a team. I would welcome the chance to provide you with additional information in addition to what appears in my enclosed CV. I am available for an interview at your convenience.